Every once in awhile I someone tells me how “lucky” I am that I “get” to stay home with my kids. Now that’s it’s back to school and people hear my son goes to a private school I hear how “lucky” we are that we can send our children to private school. Well I have something to get off my chest. Luck doesn't have anything to do with it. My husband and I have sacrificed a lot. We wear our clothes until they really can’t (or shouldn’t) be worn anymore. We don’t go on dates often. Other than an occasional pizza we don’t eat out as a family. We don’t go to the movies or buy passes to theme parks. We don’t have cable, dish, satellite, Netflix or anything on our TV that isn't there when you plug it in. Oh and that TV? A 10 year old tube. Flat screened, but a tube non the less no fancy flat hang on the wall TV here. We cut our budget down tot he basics. We chose to put our money where our priorities are. Right now are priorities are our children. We wanted me to be home with them so we made it happen. It wasn’t easy, my husband lost his job when I was 6 months pregnant with my first. It was important to us that our children go to a Christian school so we make the sacrifice so that they can. Luck has nothing to do with it. I haven’t won the lotto or garnered a big inheritance. We just made the choice to make our dollars line up with our values. We value our children and their education and well being more than we value 300 channels, on demand movies, or other things we could spend money on. I’m not trying to be all woe is me I don’t have anything. Or to put myself on a pedestal and say you could all stay home too if you just did what I did. I know that’s not true. Everyone’s situation is different and I am sure that very few of us got where we are completely on luck. 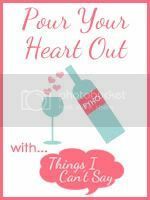 Linked up with the fabulous Shell at Things I Can't Say for Pour Your Heart Out, you can join in too, just click the button. We sacrifice for me to stay home. We'll be sacrificing even more now that I quit my wah job. But, we do what we have to. I have heard a lot of criticism lately about our decision to send my middle son to private school. That we should just send him to public- for a variety of reason, money being one. And fairness another- b/c we are keeping our oldest in public school. But, we all do what we feel is right for our families. And make sacrifices along the way. Oh how I get this. I mean really get this. While the situation is a little different, I can sympathize with you on this one. I've had people tell me I'm lucky that I can stay at home and still have an income. I usually tell them that they are more than welcome to the income, but they have to take the wheelchair and the muscular dystrophy with them. Either way, I agree -- it's not all about luck. Maybe it's about blessings. We are blessed that we have this choice to make, and that our resources (however thin) are helping us get there! So true! We are in the same situation you are in. We are just waiting for our 10+ TV to break so we can buy a flat screen TV, but we just watch free TV. There are times when I regret leaving my teaching job, because now times are so tight in the education field that I might not be able to find a new position when I start applying. But these years at home with my babies are years I can never get back, and I'm glad we made it a priority for me to stay at home for a while. Oh my, I love this. Love you! When I first came out of school, I opened a fortune cookie to this gem - "The harder you work, the luckier you get." I still have that same piece of paper, almost 20 yrs later, tacked to my fridge. I would love to tatoo it to both my boys' chest (kidding CPS). "Luck" reminds me of "hope" - both excuses wrapped in blame. 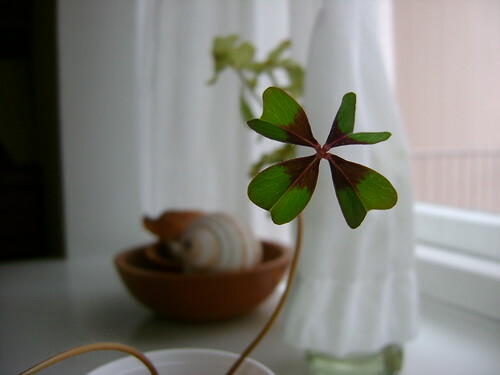 Make your own luck, and be happy when someone else's hard work rewards them with "luck" as well. I am in a similar boat to Jenn (Crippled Girl) in that I am visually impaired, legally disabled, and receive benefits for that, thus I stay home with my kids AND get some income. But just like she said, that's not luck. Each family has a different set of circumstances and we each do our best with what we've got. Yes. Well said. We're in the middle of cutting even more now that G is getting ready for school. It is prioritizing. But I do feel fortunate that my hubby has a job that pays the way it does. Because without that, I think even with lots of cuts, we'd not be able to afford private education. Sing it sister. When we tell people we don't have cable, they look at us like we have leprosy. I'm happy to drive an old car, so long as it is safe (albeit ugly). Us having no debt is no accident. It isn't because my husband makes a huge salary. It's from lots of hard work! I'm not trying to be all holier than thou. I truly feel bad for people who get sucked into society's call for them to think that "want" is the same as "need". It's only through a really strong and principled man and marriage that I've been blessed to not fall into that trap too! I agree, luck isn't part of being a stay at home parent. It's a sacrifice you make because you feel that it will benefit your child. I know, as a @home parent, I have less "free" money then my working friends. I would not trade it for the world though. I'd say blessed. Blessed to be able to figure out how to make your desire a reality. Blessed to have a husband who is able to support your family. Blessed to be able to provide the future you'd like your children to have. Blessed, not lucky.